The Boys & Girls Clubs of Greater Oxnard and Port Hueneme announced its Summer Camp schedule, beginning on June 21, 2010. Camp themes include exploring the outdoors, space exploration and many more. Summer camps will run through August 27, and free lunch is provided to all members June 21-August 6. The camps offer quality summer programs in a positive, safe and supervised environment at three of the club’s branches in Oxnard and Port Hueneme. Camp activities include arts and music, classes in technology, games, social recreation, a variety of learning opportunities and field trips to the beach, Griffith Observatory, LA Zoo and much more. Sports camps include basketball, cheer, soccer, and flag football at a cost of $85 per week with membership. Day campers have the opportunity to participate in special events like mini-carnivals, talent shows, obstacle courses, picnics, ice cream socials and water days. Children are placed in age-appropriate groups and must be 6 to 12 years old to attend. Registration materials available at the Martin V. Smith Youth Center. Scholarships are also available – please see staff for more information. Erin Antrim, Director of Program Services and Tim Blaylock, Chief Professional Officer of Boys & Girls Club of Greater Oxnard and Port Hueneme receive the prestigious Merit Award for Program Excellence in the Arts from April Hawkins, Program Director, MetLife Foundation. On Friday, May 14, 2010 the Boys & Girls Clubs of Greater Oxnard and Port Hueneme received Boys & Girls Clubs of America’s prestigious Merit Award for Program Excellence in the Arts for its Peace Thru Music and Voices of Hope Choir program. The award was presented at a recent ceremony held during Boys & Girls Clubs of America’s 104th National Conference in New York, N.Y. Merit Awards for Program Excellence, which are sponsored by MetLife Foundation, are presented for outstanding programs developed and implemented in Boys & Girls Clubs across the country and come with a $2,000 cash award. Each year, hundreds of entries are submitted in the five core program areas: character and leadership development; education and career development; health and life skills; the arts; and sports, fitness and recreation. Peace Thru Music is part of a variety of arts programs available to youth in the Oxnard and Port Hueneme communities. The program has been awarded grants totaling $17,500 for purchase and repair of instruments over the past two years by the Academy of Country Music’s philanthropy, ACM Lifting Lives®. ACM Lifting Lives is dedicated to improving lives through the power of music, with grants funding programs that promote education and healing through the power of music. “Throughout the country, we’re funding programs that provide stipends for new music teachers, instruments for students and men and women in the armed forces, and music therapy in after-school programs and in health care facilities. Through these programs, we’re helping improve lives through music with a broad and diverse reach,” said Erin Spahn, Director of ACM Lifting Lives. Additionally, the Clubs’ Voices of Hope Choir and Orchestra – a partnership with the Rio School District, gives opportunity to after school program students to take part in the choir program on-campus. “We are thrilled to receive national recognition for Peace Thru Music and the Voices of Hope Choir and Orchestra. We look forward to partnering with ACM Lifting Lives to provide innovative programming to our local youth” said Tim Blaylock, chief professional officer of the Boys & Girls Clubs of Greater Oxnard and Port Hueneme. “I am truly humbled by this award and look forward to continuing to change lives through music,” noted Tony Barnes, director of the Peace Thru Music program. The cost for parents to send their child to a Club in Oxnard or Port Hueneme is just $15 per year, and no child is turned away due to economic hardship –scholarships are available for any child whose family cannot afford the annual fee. For more than 55 years, the Boys and Girls Clubs of Greater Oxnard and Port Hueneme Clubs have provided programming to local youth with an emphasis on five core Club program areas: Character & Leadership Development; Education & Career Development; Health & Life Skills; The Arts; and Sports, Fitness & Recreation. Activities in these five core areas support Boys & Girls Clubs of America’s overarching goal to help each child reach their full potential and BE GREAT by securing academic success, living a healthy lifestyle and distinguishing themselves as young leaders. The program allows for open enrollment and is free to all Club members. In addition to students, the Club is seeking volunteers and donations of musical instruments and music books. If you, a friend or loved one have an instrument which is no longer being utilized and would like to find a home for it, please consider donating it to the Boys and Girls Club of Greater Oxnard and Port Hueneme. Contact Linda le Brock, llebrock@bgcop.org or 805-815-4959 x 205. For those interested in volunteering, please contact Tiffany Lopez, tlopez@bgcop.org or 483-1118. To learn more about the Peace Thru Music Program or about the Clubs, please contact the Boys & Girls Clubs of Greater Oxnard and Port Hueneme at 815-4999 or visit http://www.peacethrumusic.org. The Club welcomes anyone interested to visit the Martin V. Smith Youth Center and see first-hand the impact being made on today’s youth. ACM Lifting Live® is the philanthropic arm of the Academy of Country Music dedicated to improving lives through the power of music. Each year, ACM Lifting Lives provides grants to music therapy and music education programs. Other giving includes serving members of the country music community who face unexpected medical or financial hardship through the Diane Holcomb Emergency Relief Fund and partnering with artists to improve lives through music. For more information, please visit http://www.ACMLiftingLives.org. Members of the Boys & Girls Clubs of Greater Oxnard and Port Hueneme have higher high school graduation rates and lower teen pregnancy and crime rates than other area youth. This equates to a 400 percent return on investment in club programs. To date, $89,000 has been invested by generous and caring members of the community toward its $115,000 goal for the It Just Takes One Campaign. That leaves $26,000 left to be raised by June 30, 2010. At Boys & Girls Clubs, any gift—no matter how big or small, is immensely appreciated. This is the idea behind our It Just Takes One Campaign: It just takes One caring adult, One Boys & Girls Club, and One gift to forever impact the life of a child. To that end, the Club is encouraging individuals to help sponsor a youth – or more to receive programs and services offered at the Club, as it nears the end of its campaign. The annual campaign raises funds to bridge the gap between membership fees and program costs. While members pay $15 per year, the club pays $500 per year in program expenses for each child in club programs. To make a donation to the campaign, visit http://www.positiveplace4kids.org/getinvolved/donate.htm. 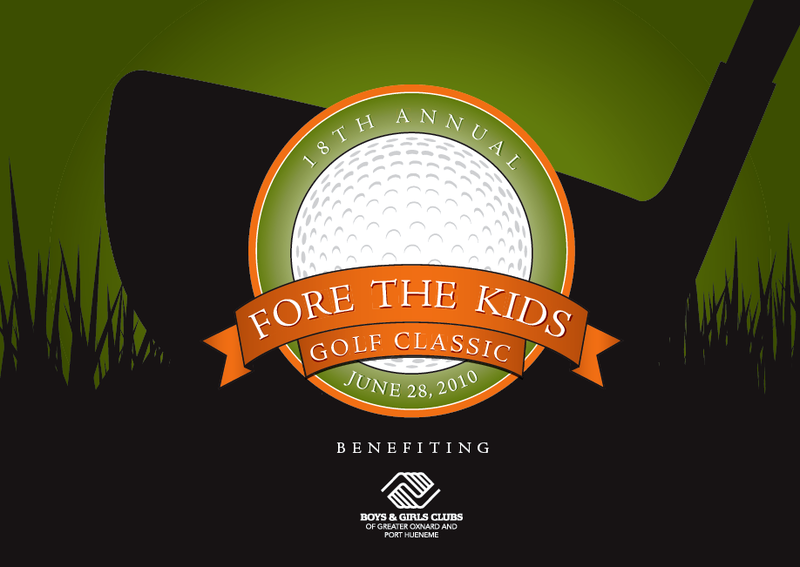 OXNARD, Calif.—The Boys & Girls Clubs of Greater Oxnard and Port Hueneme is looking for sponsors and players to take part in the 18th annual “Fore the Kids” Golf Classic. The charity tournament, honoring Carl Lowthorp and Bob McMillan, will be held Monday, June 28 at Las Posas Country Club. Former NFL player Keary Colbert and his surprise NFL guests will also be playing in the tournament and available for autographs and photos for those participating in the tournament. “This annual event attracts civic and business leaders from Ventura and LA Counties and sells out every year. We are looking forward to another great tournament benefitting our greatest asset: our youth,” said Tim Blaylock, Chief Professional Officer of the Boys & Girls Clubs of Greater Oxnard and Port Hueneme. Entry fee to the tournament is $295 per player or $1180 per team. The registration fee gives each player access to green fees, cart, lunch, contests and an awards banquet, held after the tournament. Sponsorship packages are available, ranging from $250-$10,000. For information on how you can get involved please go to http://bgcop.org/news/events/golf.htm or contact Meggan McCarthy at 815-4959 ext. 204 or mmccarthy@bgcop.org. Last year’s tournament netted more than $30,000. Funding from this event helps support the programs and services at the 18 Boys & Girls Club locations in Oxnard and Port Hueneme. The Club currently serves more than 7,200 youth in the Greater Oxnard and Port Hueneme area. While members pay $15 per year, the club pays $500 per year in program expenses for each child in club programs. By involving parents, volunteers, educators and the business community, the Boys & Girls Clubs of Greater Oxnard and Port Hueneme helps youth reach their full potential through a positive environment, lifelong learning and programs dedicated to the arts, education, character and leadership development, health and recreation. Programs are based on physical, emotional, cultural and social needs, and are designed to expand participants’ areas of interest. For more information, visit http://www.positiveplace4kids.org. 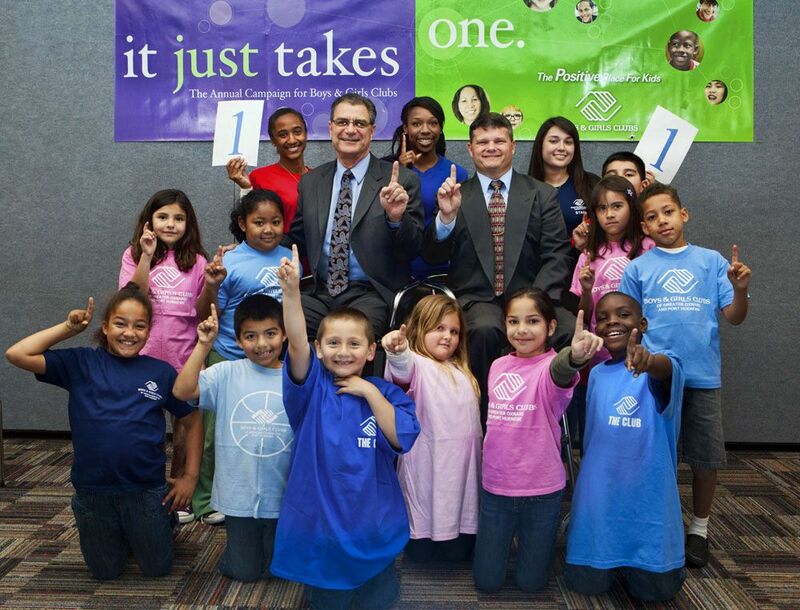 Mayor Tom Holden and Mayor Norm Griffaw are helping us celebrate the important work of our Boys & Girls Clubs in the Greater Oxnard and Port Hueneme communities by serving as the honorary Co-Chairs for our “It Just Takes One” campaign. Soon you will see bus shelter signage popping up in Oxnard and Port Hueneme with their photo along with some of our kids promoting “It Just Takes One!” We are grateful to these two community leaders for their commitment to the children in our community. Along with the Mayors’ support the Martin V. Smith and Martha K Smith Foundation has provided a community matching challenge grant; for every dollar donated to the Boys & Girls Clubs of Greater Oxnard and Port Hueneme over the next two months, the foundation will match dollar for dollar up to $50,000 for kids programs. We are very grateful for this generous and kind gift and believe with the help of the community, will match this gift in the next 60 days. It’s even more significant this year, as our Clubs undertake a campaign with a special emphasis on increasing support from individual donors in our community. Given the important role of our Clubs, there’s no reason why every caring citizen shouldn’t add his or her name to the honor role of supporters. When it comes to our kids, we usually think of the home, with a solid family life and parental guidance, as the answer to nurturing and protecting them. But for too many children in America, there’s a gap. Research indicates the hours of 3-8 p.m. are the most dangerous time of day for young people – when crime involving youth doubles as they leave school and return to empty households or neighborhood streets, idle and unsupervised. The answer, according to experts, is to provide after-school programs in every community. In neighborhoods with effective programs, most youth-related problems are minimized. Children are safe, they’re involved in life-enhancing experiences with caring adults and meaningful challenges, and they can better deal with the larger threats and fears affecting our nation and our world. The Boys & Girls Clubs of Greater Oxnard and Port Hueneme believes every child and teen should be involved in a safe, structured, supervised after-school program, every day. As we approach the summer months with many of our school districts unable to provide summer school programs due to California budget short fall, the need will be even greater this year to provide more out of school time programs and activities. One tangible step is to support the Boys & Girls Clubs of Greater Oxnard and Port Hueneme’s’ annual fundraising campaign. It’s an investment in our community’s most precious resource: our children. At Boys & Girls Clubs, any gift—no matter how big or small, is immensely appreciated. This is the idea behind our It Just Takes One Campaign: It just takes One caring adult, One Boys & Girls Club, and One gift to forever impact the life of a child. •	A safe place for those who may be left alone after school or on the streets with no guidance. The Clubs are a safe place to play and a place safe enough where kids can be themselves. •	Life-enhancing programs that can open young minds. The Boys & Girls Clubs expose youth to new ideas and skills that prepare them for life. We teach the importance of character in all of our programs. •	The availability of dependable, caring adults who are responsive to a child’s daily realities are critical to developing meaningful, often lifelong relationships, that enable children to reach their full potential. Donations to the It Just Takes One campaign may be given at http://tinyurl.com/3yvtka2 online or through the Boys & Girls Clubs of Greater Oxnard and Port Hueneme. For more information, please call Linda LeBrock at 805-815-4959 x 203. Will you BE The One?